Updated Wednesday January 30, 2019 by El Campo Little League. 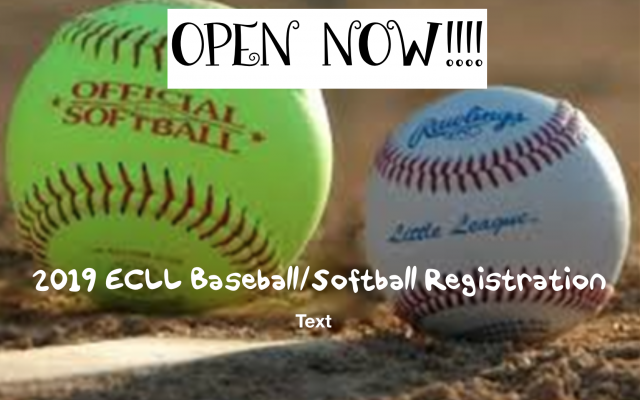 Welcome to the 2019 El Campo Little League Registration! If you are registering a child for the 2019 spring baseball season please be sure to read the important information noted below. See 2019 Little League Age Chart to determine your Child's Little League Age. Please note, all divisions below are listed either boys or girls only except Tee Ball. Tee Ball will be co-ed this year. If you are new to the league, please make sure you reside in the El Campo Little League Boundary before registering. The map can be found under the Downloadable Forms & Files Section. If you live outside this boundary, but attend an El Campo School within this boundary, your son or daughter can participate in Little League. A School Enrollment Form must be completed and emailed over to the Player Agent. This form is located under the Downloadable Forms & Files Section. Parents may request under COMMENTS for a 6 year old BOY to play in Single A Division. If the request is made the player MUST try out for Single A. Parents may request under COMMENTS for an 8 year old to play in Minors AA. If the request is made the player MUST try out for Minors AA. Parents may request under COMMENTS for a 10 year old to play in Majors. If the request is made the player MUST try out for Majors. Parents may request under COMMENTS for an 12 year old to play in Juniors. If the request is made the player MUST try out for Juniors. Parents may request under COMMENTS for an 8 year old to play in Minors Division. If the request is made the player MUST try out for Minors. Parents may request under COMMENTS for a 10 year old to play in the Major Division. If the request is made the player MUST try out for Majors Division. 13-16 year old boys will be drafted to play in the Senior League Division. Mandatory tryouts will be for Boys Pitching Machine, Boys Minors and Boys Majors as well as Girls Minors AA and Girls Majors prior to draft. Please carefully read the statement below regarding players wishing to play in a division higher than what they signing up for. If your child wishes to play up in a division higher than what is outlined above for their age, then they will be required to attend tryouts for the higher division. This will not guarantee their inclusion in the higher division, but will give them the opportunity to display their skill and participate in the draft. If they are not drafted in the higher division they will automatically be included in the draft for the division that matches their age. Tryouts will be held on February 2, 2019 with makeups on February 16, 2019 if necessary. "Any information on registeration yet."